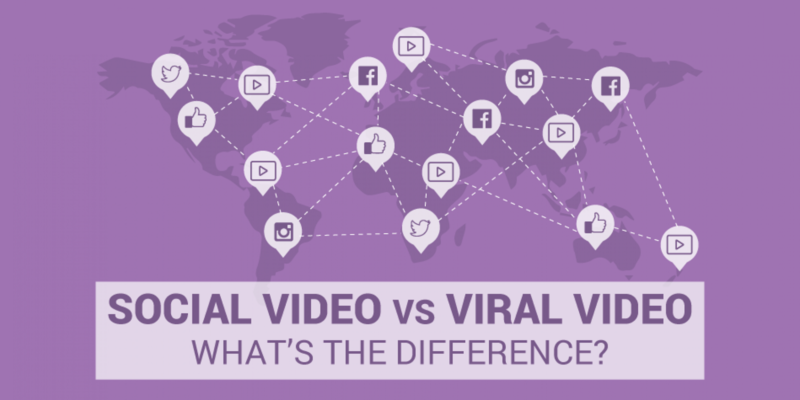 Social Video vs Viral Video. What’s the Difference? Over the past couple of years, video has become more and more popular, with two terms constantly arising amongst social media marketers: social video and viral video. Right now in the world of social media, video is the one thing that users can’t get enough of. Videos are everywhere. In 2015, Facebook recorded 8 billion daily views from 500 million users. Snapchat shortly after announced that they have caught up with Facebook’s daily video views of 8 billion. Social videos and viral videos are not exactly two completely different things. If you are wondering what the difference is between the two, not to worry, this blog will explain the two terms and just how useful they are for video marketers. We start with the older term. A viral video can be described as a video that has been made popular through the process of sharing online, most typically through video sharing websites and social media. Viral video’s go beyond the number of views they generate. Viral videos is all about spreading a particular message without having to put in the measures to spread it yourself. A social video is a term used to describe a digital video to be specifically shared through social networks and on social media. However, unlike viral videos, social videos are designed to promote real time engagement and interaction between you and your audience. Measuring the success of a social video is very different in comparison to that of a viral video. Whilst viral videos need a certain amount of views to be deemed as a success ( or viral), social videos need the right viewers. Are you now familiar with the two? Sign up here and get started on your video animation right away. If you still aren’t 100% sure, you can find a more detailed match up of both videos below. So just how do the two fare against each other. For starters, viral videos aim to capture those with short attention spans. One minute a viral video is massive the next minute it has slipped away. On the other hand, social videos focus on gaining attention, gradually increasing over time. Regarding socialization. Viral videos don’t require any form of online socializing or engagement. The video is shot, uploaded and goes viral based on views and shares. Social videos however largely depend on the engagement around them and scale of conversations. While social videos success does depend on the message they are expressing and the authenticity of the video, viral videos can achieve views on shares without following any specific code of conduct. Viral videos can be fake and still have the power to be successful. Perhaps one of the biggest differences between the two is who they target. As we have said previously, viral videos revolves around a number of views and shares. They don’t specifically need a target audience, or objective to go viral. On the contrary, social video is all about the quality. They are focused on who shares and who views their videos. All social videos have a clear targeted audience in mind and clear objectives, which success can be measured on. Both viral videos and social videos can be incredibly valuable for your marketing efforts. Viral videos look to entertain first, whereas social videos look to be of specific help. Viral videos don’t have to have the right audience watching it, which means that they aren’t necessarily created to advertise a specific product or service. Going viral, however, doesn’t always mean guaranteed success. Social videos can help a brand on various marketing objectives, especially when it comes to brand awareness. The purpose of social videos is to reach your right audience wherever they are. Do you intend to create a viral video or a social one? You can get started on your video by registering with Moovly and bring your animations to life!